R: You’ll love it. But, I’ll only take you if you promise me you won’t run there by yourself. E: Rog, I know what I look like. I can take care of myself. I’ll be fine. E: Do YOU run there by yourself? Such is the double standard for men and women runners. Men simply don’t have to think about some of the things that women do when they spend hours and hours alone, in remote areas. Although I’m sure personal safety crosses their mind, for me, as a woman, I can never let the threat of the Boogie Man wander far from the forefront of my thoughts. I never forget that the bars in Erie County close at 4 am. Drunks don’t care. I’ve had cars follow me closely and slowly. Too slowly. Men who walk alone, carrying dog leashes, when I can’t see a dog, scare the hell out of me. If I pass a man walking alone, I will always quicken my pace, listen for footsteps, count to five, and abruptly turn around, to assure he hasn’t changed direction to follow me. I have come face to face with a few strangers using this method. I’ve had my tent unzipped, while I was sleeping, while camping at a race. This weekend, I ran the HAT race. It involved some solo travel. I would be where I didn’t know a soul. 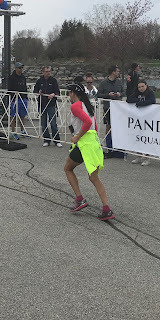 I should preface, that I never felt un-safe at this race, but I did miss the comfort of having my friends with me, watching my back. I was cognizant that if I got hurt or lost or encountered the Boogie Man, I was on my own. Rog…. Jim…. Russell…Marco, I trust these guys without reservation. My gender is irrelevant. They are simply friends. I love each of them, and adore the easy comfort of being with someone who wants nothing more than to share a laugh, some space and time, or his thoughts. I have always been able to maintain male platonic friendships. Just ask my brides men: Victor, Mike and Rob. As a woman, I know uncomfortable situations exist. I accept and acknowledge this. But, I will never let it stop me from living my life. I CAN take care of myself, and if the Boogie Man puts me in an uncomfortable situation, I will respond. At the HAT race, I had no worries; there was no Boogie Man there. 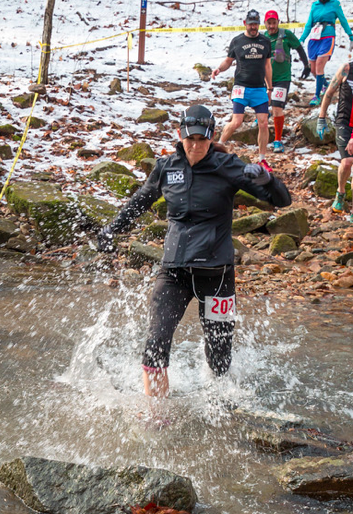 I was able to crunch over the snow-covered start, squish through miles of mud and giggle my way through knee-deep streams. Without my friends around, I may not have felt comfortable enough to crash-out at the finish, like at the Beast. But, otherwise, I was able to do what I love, on a beautiful course, on a (eventually) gorgeous, almost spring-like day. I had my own back, and there was a smile on my face.